This is the part 2 of the maths shortcuts. You will find Part1 here. 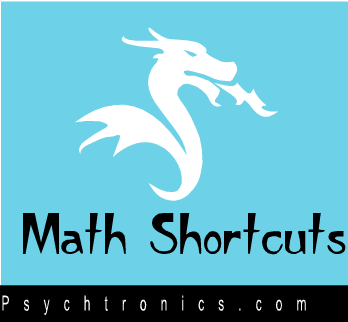 Here is some math short cuts which is are used to help to increase the performance of your brain cells. These shortcuts are specially designed by the experts only for the visitors of PsychTronics. 752 means 75 x 75. The answer is in two parts: 56 and 25. The last part is always 25. Similarly 852 = 7225 because 8 x 9 = 72. Show your child this truly beautiful method of dividing by 9. The first figure of 23 is 2, and this is the answer. The remainder is just 2 and 3 added up! The first figure, 4, is the answer and 4 + 3 = 7 is the remainder—could it be easier? Longer numbers are also easy. The answer consists of 1, 4 and 8.
and 8 is the total of all three figures 1 + 3 + 4 = 8.
the car numbers by 9, using this remarkably easy method. Actually a remainder of 9 or more is not usually permitted because we are trying to find how many 9’s there are in 842.
marvellous method for dividing numbers. sum can be put down in one line. We use THE FIRST BY THE FIRST AND THE LAST BY THE LAST. figure of 72: 36 ÷ 7 = 5 remainder 1. The remainder, 1, is placed as shown and makes 19 with the 9 following it. 19 - 10 = 9, the remainder. 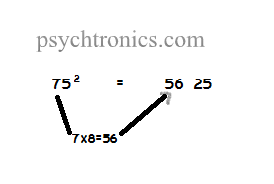 then 48 - 3 x 6 = 30, the remainder. covers all areas of mathematics. It is not possible to show all variations of the methods in this article: all the techniques shown can be extended in various ways.